You Got That Interview You Wanted – Now What? You’ve been applying, and in today’s market, there is no shortage of jobs that could grab your attention. In fact, the latest JOLTS Report announced that 7.6 million job openings were created in January 2019. The company or the recruiter that brought you there has set up an interview with you. What should you do to prepare for the big day? I like to look at things in a goals/desired outcome scenario. What is the goal of applying for a job? To receive an offer, right? To do this, it’s often best to break things down into steps. In most cases, the first interview will be one step and very rarely will you receive an offer after the first interview. With that said, look at the goal of the first interview as having the purpose of getting to the next one. Do your research on the company, the people you’re meeting with, and be prepared to speak intelligently to the things you know that could make you a fit for the company in the interview. A first interview is often only thirty minutes or an hour at most. Maximize that time by learning what your prospective employer is struggling with, or why they’re looking to fill the role and highlight what you have done in your career that relates to that. With introductions and pleasantries, a portion of your time will be used up. Make the most of what you have by asking solid questions about what they’re looking for to see if you truly relate. It will make you a stronger candidate in the long-run. Or, may even help you realize that this isn’t the role for you after all. Good luck! And if you need some help with that first interview, check out some of our guides to a successful interview. 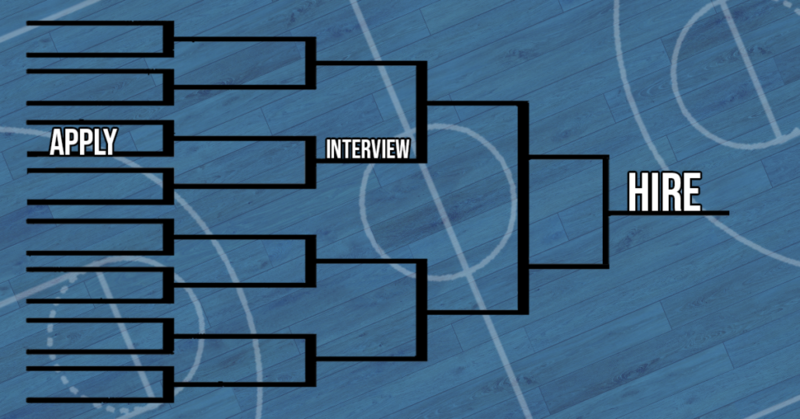 Whether you’re a candidate or client, you can relate the job search to the exciting 18-day roller coaster ride of March Madness. It’s inevitable that when you’re applying for a job, you’re trying to win each step or “game” of getting that offer letter. The more games/steps in the job process you win, the closer you get to the championship round bracket! Companies and candidates are hoping they both can win in the end. And lucky for you, the only difference between March Madness and the craziness of this candidate-driven market is both parties can win at the end of the day! A candidate finds a job and a company finds a great employee. The main thing is though, you want to effectively navigate the madness of this job market so you can reach the championship round! And whether you’re a candidate or an employer, here’s how you can do it. As a company looking to hire a great new employee, one of the most important things you need to do is find them. The way you can do this is by making your job descriptions concise and clear. It will help you find those winning candidates through the madness of this job market. Make sure to focus on what they will do, the fun things about your company, and of course, the experience and skills they need to have. Being a candidate in this market can be overwhelming. Even though it’s good to see what other opportunities are out there, it’s stressful. There are so many jobs to choose from and it can be hard to narrow down what you’re truly looking for when you’re ready to move. But the first step is knowing what you’re looking for in a new job. Are you wanting more freedom or maybe a company that has an amazing culture? Are you looking for more money or a different location? These all are questions you need to answer before applying. It will help you weed out the jobs you may like but wouldn’t be a great fit for you. Because let’s be honest, you’re moving because you want bigger and better. Don’t bog yourself down by applying for jobs you wouldn’t absolutely love! And if you’re having a difficult time finding a job that’s a good fit, that’s where a recruiter, like one from JSG, comes into play. We’ll help you match your skills to a position that you will be successful in! When it comes to this tight job market, you have to have a quick process! 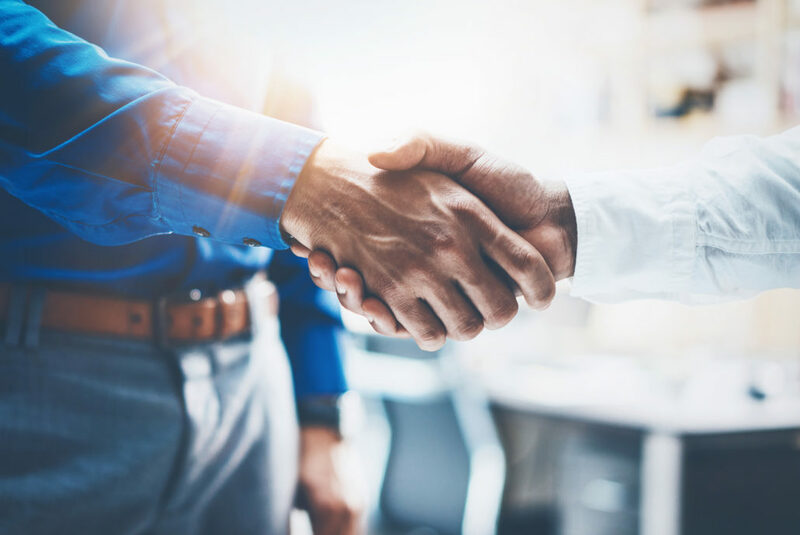 There are tons of different ways you can do that and sometimes relying on a recruiting firm, like Johnson Search Group, can be the biggest money saver and helping hand you could ask for. An efficient process will prevent your bracket of good candidates from busting and not leave them vulnerable to receiving other offers. As a candidate, you have to be prepared. Just because you may have a lot of job options, it doesn’t mean you want to slack on being ready for an interview. A company doesn’t have to hire you, even if they may need to. They still have a choice but so do you! So take this time to find out information about the company. What are their reviews like? Do they have cool accolades? Are they involved in community service? All of these things will help you understand a little bit more about what this company does and how they treat their employees. And remember, in an interview, they aren’t just interviewing you, you’re interviewing them as well. After you’ve gone through the madness of resume reviews, interviews, and on-site tours, you’ve probably had the opportunity to find a great candidate; the one you want to extend an offer to because you know they will truly be a great fit and add a great amount of value to your organization. This is the fun part; you’ve made it to the championship! After going through the wringer, you’ve made it! You’re now onto the championship with a company you’ve found passion in. The ball is now in your court and if you say yes, you’re ending this game with a slam dunk! Today’s job market is overwhelming not only for companies but also for candidates. If you’re struggling to find the right people or the right job opportunity, Johnson Search Group would love to give you an assist in hopes of finding you your perfect matchup! Get an assist from JSG to help you navigate this crazy job market. So, you just got off the phone with the business or organization you’d been applying to. The hiring manager explains that the company is going to go in a different direction. You feel your stomach drop and realize that it’s back to the job boards, and your search for a new job continues. It’s easy to become discouraged following this event, especially if it isn’t the first rejection you’ve faced so far. While it may feel far from it, you did several things right to get this far. Someone reviewed your resume and deemed it impressive enough to follow up with you. You may have passed an initial phone screening to get to the interview itself. But somewhere between the inception of the interview and the phone call you received, the employer decided to go elsewhere. Here are a few possible reasons why. You could have simply messed up in a very basic (and easily fixable) way. Things, like being late to an interview or forgetting to bring required items, will almost always disqualify a candidate. An interview is meant to showcase your strengths, not highlight unpreparedness by leaving your resume at home. You could have missed the mark on the dress code or been unable to answer questions pertinent to working in the industry. Failing to do your research on a company beforehand is a clear red flag to the hiring manager. They will almost always hire the candidate that is best prepared for the job and is able to prove it in the interview. If you didn’t get hired for one of the reasons listed above, don’t worry because these are easy fixes. We have written tons of articles from what to wear to an interview to all the things you need to do before it. But, you could have done all the basics right and still not gotten hired. Sometimes, hiring managers can dive deep into our resumes, applications, and interviews and find something that prevents them from hiring you. Ensure that all public social media profiles are professional, whether that be reviewing tagged photos or reading through old posts. Depending on your background, experience, and resume, a hiring manager may make inferences about your desired career and future. 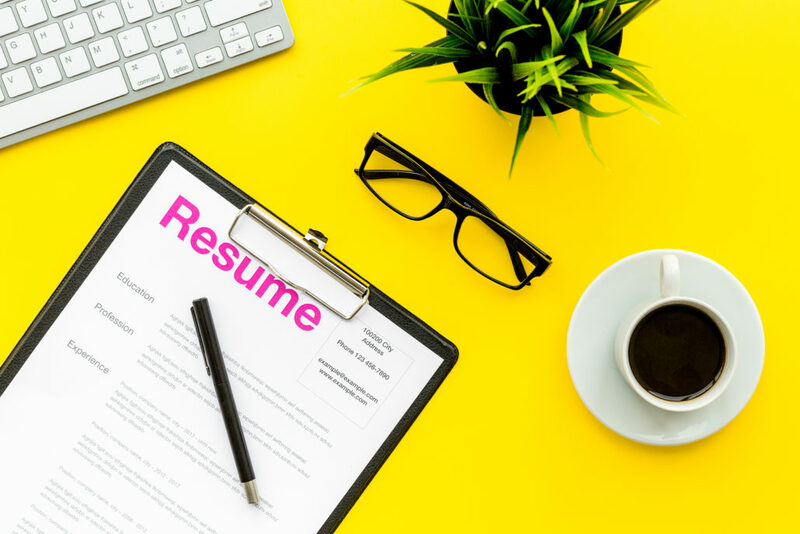 If you have gaps in your resume or have been employed multiple places in a short amount of time, they may not hire you out of the fear you’ll leave. Your body language could have betrayed you, and your mindless fidgeting you didn’t even notice in the interview told the hiring manager you’d be easily distracted. You could have been perfect throughout, except for a key area that ultimately is the reason you stay job hunting. Talking poorly about a past employer, or even asking about the salary can also prevent you from getting that callback. At the end of the day, keep your head up, review the basics, and do your homework. If you steer clear from the mistakes outlined above, you’ll nail that next interview! The interview is your chance to shine. And to make sure you hit it out of the park, there are a few things you need to focus on. You need confidence, experience, and you must bring value during an interview. However, you can demonstrate your value in different ways. And it can be the one thing you do that leaves the interviewers with a good lasting impression on why they should hire you. Why will you be valuable? If you answer this question without having to be asked, you hit a point that is pertinent to why you’re there in the first place. They are not just looking for someone to fill an empty role. They’re looking for someone to bring value to their team and help them accomplish the things they need to accomplish. If you can show how your experience will get that done for them, your value will shine. Ask questions about what they’re wanting you to accomplish if you receive this role. Make it about them and their needs and explain how you can accomplish that. Remembering that an interview is a two-way street to see if the job is also a fit for you and your abilities is important. In this job market, you have plenty of opportunities, so make sure you get down to what they are looking for and if you really can accomplish that for them, is important. The best part about asking questions is you take the interview from a nervous/serious time to a more comfortable, friendly environment. And everyone will enjoy that. You can show a tremendous amount of value if you prove that you would fit great with their culture. Nowadays, there are a lot of different working environments. Some that are great and some that are terrible. But depending on your working style you can be just fine in either. It just matters to you if you mesh well. And this is also a very valuable thing to companies. No matter their reputation, they are always trying to bring in good people that will help improve the culture. And if you can show that you’re that person, it will only help you. Being an independent worker is something that a lot of companies are looking for. They want to know that you don’t need to be micromanaged to get your work done. They want to know that you have enough self-discipline to meet deadlines without needing constant help or oversight. Explain how you like to work and point out your independent tendencies. 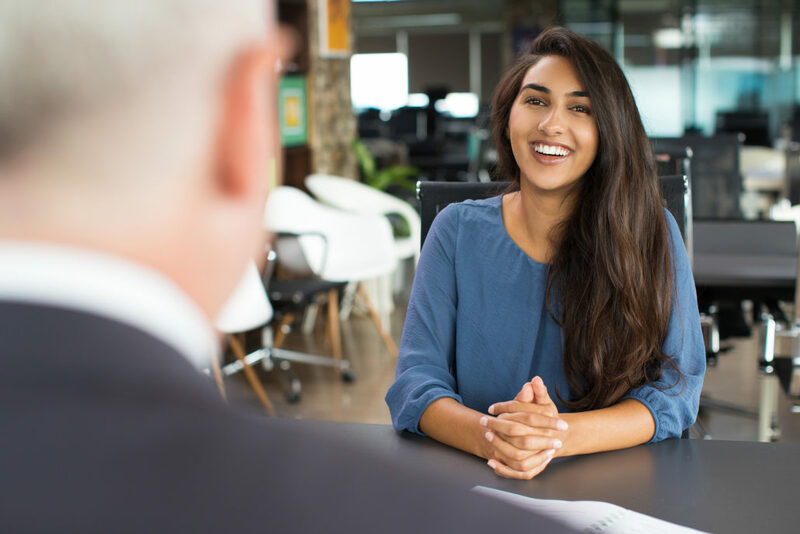 If you can demonstrate your value during a job interview, you will definitely make a lasting impression on the interviewers. If you need more help preparing for your upcoming interview, we have tons of resources to help you nail that interview and land the job. Good luck! Whether you’re currently unemployed and looking for a new opportunity or you have a gap in your work history on your resume, this can be a tough topic to navigate. If you have a lapse in your work history, you will likely be asked about it during your job interview. However, how you respond to this topic will make or break your chances of nailing the interview. Here’s how to discuss this issue if it comes up. First of all, if you find yourself in this situation, prepare an answer ahead of time. The interviewers will likely notice if you have a lapse in your resume. Especially if it’s a significant gap. If it’s only a few weeks or a month, the question probably won’t even come up. However, if you were out of work for several months at a time, it will likely raise some red flags. But don’t panic! If you find yourself in this boat, take a few minutes to prepare your answer beforehand so you can answer it briefly and move on to the next question. Regardless of why you were/are unemployed, keep your answer positive. If you were laid off or fired, don’t start badmouthing your previous employer. That never reflects well on you. Instead, try to keep it positive. If you talk poorly about a past employer, what will you say about the organization interviewing you for their open position? And if it was a voluntary unemployment, the hiring manager will wonder why you left. Again, keep it positive. Did you take a break to focus on your health? Did you use your time off of work to hone a new skill or earn a certification? By focusing on the positive, you will reassure the interviewers that you’re a strong candidate and won’t bring any drama to the company. This is probably the most important point. The more information you offer, the bigger the hole you may be digging for yourself. Don’t sit there and blather on. Instead, keep your answer short and sweet. Answer the question concisely, positively, and spare any details that aren’t necessary. It can be easy to simply keep offering up unnecessary information to try and justify your absence from the workforce. Nonetheless, if you come prepared and follow the advice outlined above, the interviewers will likely move on to the next question without putting you through the wringer. I recently had a conversation with a healthcare organization who is looking to fill a critical role. We were talking about the needs of the organization and what the impact would be if the position isn’t filled. The conversation was going along just fine until I asked how long it would take to make an offer after a successful interview. The hiring manager stated that once they were to identify a talent pool of four or five finalists, they would make an offer to the most qualified. While this may sound like an ideal option for hiring the best candidate, it is not a reality in the current labor market. Basically, I ended the conversation with, I am not the recruiter for you. Reviewing and responding to a resume within 48 business hours. This is vital, as the race to the finish line of getting a candidate to sign on the dotted line of an offer is very competitive. Secondly, the response if you like the candidate’s background, is to schedule an interview, with the first phone interview taking place in the next few days. If that is not possible, I highly recommend finding a way to make it possible! After a successful phone interview, schedule the next interview. If it’s a second phone interview, the same maximum of two or three days applies. Whatever the next interview step is, making those arrangements within the next 24 business hours is critical. It shows the candidate you are excited about them and gets time removed from their calendars when they could be interviewing elsewhere. The final interview should be scheduled immediately and should take place no later than one to two weeks out, depending on travel. However, if it’s a local candidate, schedule it no later than one week out. If you can, schedule a Skype interview and if it is mutually agreeable with the candidate, make your offer! Essentially, the more efficient your hiring process is, the easier it will be for you to attract great candidates. Make your offer within 48 business hours of the interview. If you need to do background, reference checks, etc. make the offer subject to successful background, references, etc. I cannot stress strongly enough, if you like the candidate, do not wait. If they would be a good fit for your team and the skill set you are looking for, don’t wait! Do not wait to see if there is possibly a better candidate out there; do not wait for a few days or weeks in case you get lucky and someone applies directly so you don’t have to pay a recruiting fee; and the numerous other reasons and excuses that are possible. And for heaven’s sake, the excuse that HR is too busy to complete the compensation and offer letter just does not fly. Your Human Resources department wants this role filled as well, as it takes one more thing off their plate. It just takes a bit of communication to your HR department that this is a candidate they need to expedite. The final step in selecting the best recruiting firm. And here’s some things to consider when seeking the help of a professional. In the world of career changes, the first step of course: resume submission. 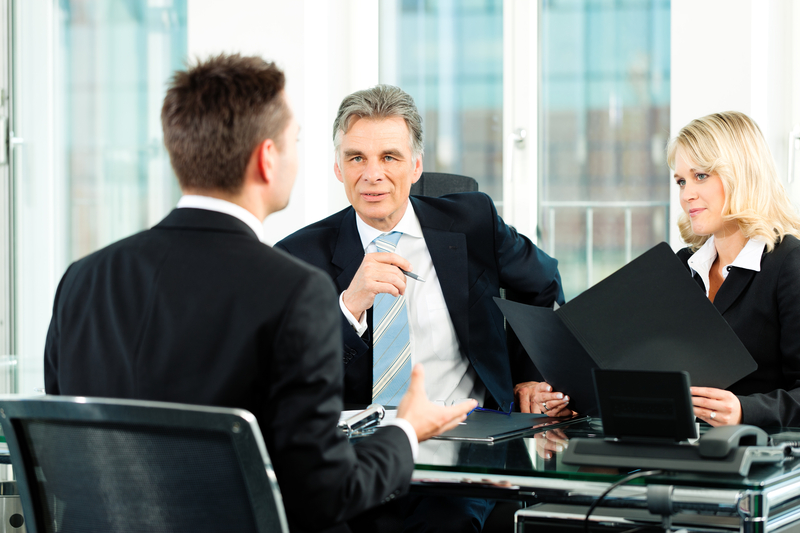 Second is the decision by the hiring manager to interview, followed by an actual interview. However, there is often a delay in scheduling interviews when a hiring manager is swamped while doing double duty to fill-in for the open role. That has always been a challenge, but fast forward to the candidate-driven market of 2018 (that promises to continue in 2019), and the time to fill ratio gets even worse; after all, you can’t hire someone you haven’t even interviewed, right? 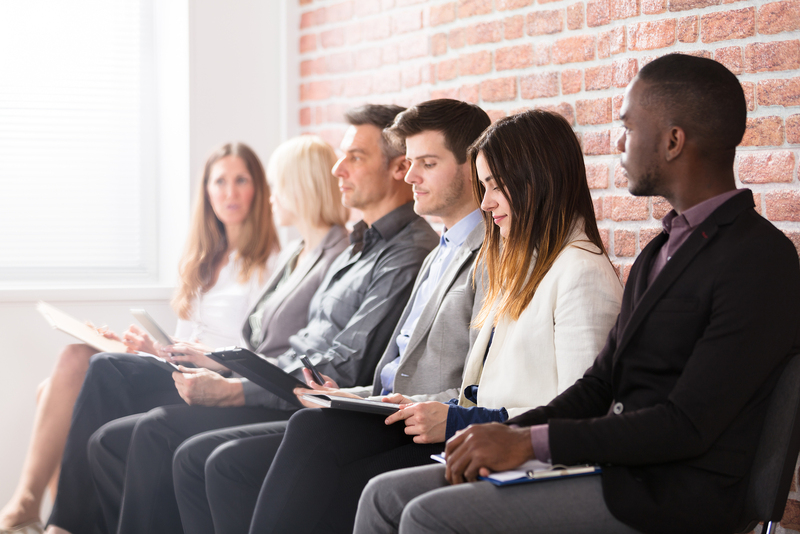 When the applicant pool is already minuscule, how do you plan ahead for possible interviews when you aren’t even sure you’re going to get qualified applicants to consider? When there are fewer candidates to select from, the luxury of being able to take your time doesn’t exist anymore. Hiring managers can no longer plan an ‘interview day’ to knock out all your interviews in a single day. If that is a policy that your organization still employs, you will likely have as much chance of winning the lottery as hiring an A+ level candidate. First, you could get lucky and have a candidate who will accept no substitutes, they just have to work for you, and will wait as long as it takes… I would suggest buying a lottery ticket instead. Second, you call to schedule the interview and they have taken another position. Third, you finally schedule the first phone interview and the candidate tells you they already have an offer from another company. So, unless you want to hire them over the phone, they are going to accept the other offer… a bird in the hand after all. Fourth, you start the interview process and you get to the point of the onsite interview. And then you find out that you are in a salary bidding war with one or two other companies. If you had the budget to operate in this capacity, you likely would have hired a firm like Johnson Search Group to do a Retained Search and already had the position filled and been able to take that much-needed vacation. Fifth, you could finally get through the whole lengthy process as time allows, make an offer, and either get a turndown, or the candidate just doesn’t show up for their first day. After all, you didn’t show them any respect by putting them off continuously. Or, you could do what you need to in this market and schedule interviews as soon as humanly possible. If you actually want a chance to fill your open roles with A-level candidates and get the help that you need and deserve, you must act with urgency. If you want your candidates to remain excited about the opportunity of working for you, in the infamous words of Nike, Just Do It!